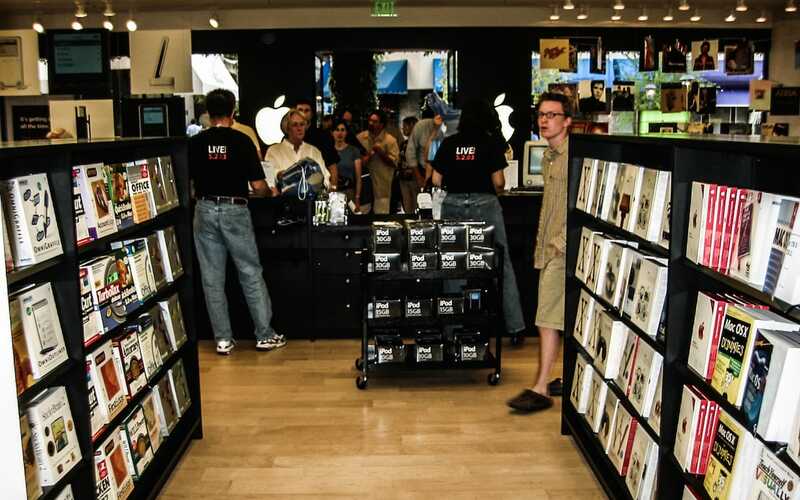 Launch party for the third generation iPod on May 2, 2003 at the Biltmore Apple Store—my last day there. You meet interesting people at the Apple Store. And everybody has a limit. During the dot-com nuclear winter of 2001 I found a job at one of the then brand-spanking-new Apple Stores as a Mac Genius. I learned there are people who thrive in a retail environment, people who genuinely think it’s great to come in to work and spend their days trying to sell things to strangers. One of our sales people was a really slick guy, handsome and hip, the kind of guy who would give a sales spiel about one of the Macs on the floor to a customer while I was standing nearby and I—one of the Mac Geniuses who knew all the specs on the thing—would think to myself, “Hey, I should buy one of those!” He was damn good at his job, and one of those people who naturally likes people. As you’d expect from a sales person, he knew just enough about technology to be able to sell the machines, which was as it should be. Remember this took place in 2002 right after the Apple Stores opened up and unhinged people considered visiting them something of a religious experience. For most people it was just a nice store, but for the faithful at that time, the backlit Apples flanking the front door was something oh so much more. This was the kind of guy who got along with everybody. What was going on? The guy my sales guy was pointing at was an annoying nerd right out of central casting—hyperthyroid-scrawny in a faded t-shirt, coke-bottle glasses and an obvious-from-across-the-room superior attitude. “What’s happening?” I asked the sales rep. It was good to know we all have our limits and though our buttons may be in different places, we all have them.